Melons are a sweet and tasty fruit that can help satisfy your sweet tooth. Melons contain about 1 gram of fiber per serving which is less than many other foods. They do offer other important nutrients that the human body needs. Melon can be included in a healthy and high fiber diet. Each of the most common melons -- watermelon, honeydew and cantaloupe -- contain 1 gram of fiber per serving. Compared to other fruits, this is relatively low. Many fruits have 2 to 4 grams of fiber per serving. However, melons contain many important vitamins that make them a healthy choice. They are full of water, which helps with hydration. Melons are a good source of potassium, folate, niacin and vitamin B6. 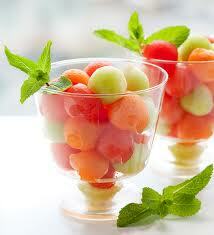 The edible part of melon contains soluble fiber. This type of fiber slows down digestion and helps to keep you feeling full longer by forming a gel in the intestines. According to the 2010 Dietary Guidelines for Americans, women should consume 25 grams of fiber per day and men should consume 38 grams. The grams; the average American consumes only 12-15 12 to 15 grams. Adding melon to your diet would be is a start, but your diet should contain other high fiber foods as well. Each summer, watermelon is plentiful and can be found at most grocery stores. It is a favorite of many and just screams summer. 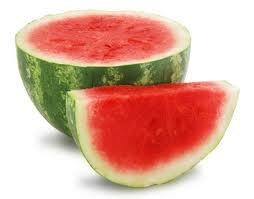 Watermelon is full of lycopene which is a nutrient commonly known for being in tomatoes. They are full of both vitamins A and C. Watermelon is one of the lowest calorie fruits. Two cups contain only 80 calories. Cantaloupe is another sweet summer fruit. It is rich in folate which helps prevent neural tube defects in unborn babies. A serving of canteloupe which is one quarter melon contains 50 calories. This melon is highest in vitamins. It contains 120 percent of the daily recommended value of vitamin A and 80 percent vitamin C.
Honeydew melons are juicy, soft, and sweet. 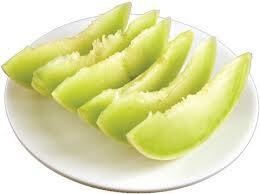 They are low in calories containing 50 calories per 1/10 of melon. They are fat free and contain 45 percent of the daily recommended intake of vitamin C.
Some excellent sources of fiber to eat in addition to melon include pears, prunes, apples, nuts, oranges, oatmeal and broccoli. Raspberries are one of the highest fiber fruits containing eight grams per one cup serving. Fruits that have edible skin are better sources of fiber than those without. A great way to include melon in a high fiber diet would be to make a fruit salad with chopped melons, raspberries, oranges and pears. What is your favorite kind of melon? Mine is watermelon! While I love all the melons, I think cantaloupe is my favorite, followed by honeydew, then watermelon. Good to know! Thanks for sharing.. Sadly, I'm not really a melon fan, especially not cantaloupe. If I had to pick though, honeydew would be my favorite. I do like the taste, but I'd rather eat other fruit. Interesting facts though.